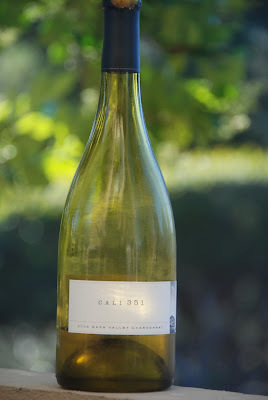 We had this CALI 351 chardonnay for the first time the other day. Oooh la la me likey. This is one Chardonnay I will definitely buy again. Here's what Wine Enthusiast had to say. "This is a classy Chardonnay. Grown 1,200 feet above Calistoga and fairly well-oaked in new barrels. It's rich and complex, with flavors of grilled tropical fruits and toasted meringue. The structure is greatly improved by a crisp, mineral edge of acidity." As I sat here drinking a glass with Don I thought to myself. Gee, this wine is pretty good. I should take a picture. It's not too oakey, sweet, but not too sweet, hints of pineapple and lemon. Very tasty. And then I looked at the bottle. Oops. It's almost gone. Should I try to pour my wine back in so it looks full? Nah, I might spill some. And that would be really, really sad. So here it is with about one glass left. It runs about $22 a bottle. I'll have to ask Don what made him pick this one up since we're on a tight budget here. Maybe it was on sale. Like you, I had this wine for the very first time this past weekend and was pleasantly surprised. I found it crisp, fruity yet dry and full. A great find at Cost Plus World Market. Cheers!